These Instant Pot Asian Peanut Noodles are packed with chicken and vegetables for a quick, healthy dinner the whole family will love! Ready in under 20 minutes, they’re perfect for a busy weeknight. Cut chicken into small bite-sized pieces and add to Instant Pot. 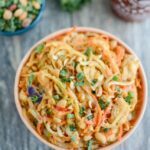 Add spiralized peppers and carrots, broccoli slaw and rice noodles. In a bowl, mix together soy sauce, sweet chili sauce, peanut butter, ginger, garlic and half cup broth. Mix well and taste. You can add more sweet chili sauce or some brown sugar for a sweeter sauce if desired. You can sub sweet potato or squash noodles for carrot noodles. Noodles will absorb sauce as it sits and especially when refrigerated. Eat the leftovers warm or cold! To make this on the stovetop, cook the chicken and veggie noodles in a large pot. Cook the rice noodles in a separate pot and add them to the chicken mixture. In a bowl, mix together soy sauce, peanut butter, garlic, ginger, chili sauce and 1/2 cup -1 cup broth. Add sauce to chicken mixture and omit remaining broth.